Nearly a decade before the days of Bob Wills and Milton Brown created the mold for the Western Swing band, the Oklahoma Cowboy Band, under leader Otto Gray, paved the way for their style of showmanship with their barnstorming nation-wide touring, widespread radio exposure, exuberant stage presence, and extraordinarily large ten-gallon hats. Otto Gray and his Oklahoma Cowboys on a promotional postcard. Circa 1930. Officially, the venerable Oklahoma Cowboy Band was founded in 1924 by real cowboy Billy McGinty, born January 1, 1871, who served in Teddy Roosevelt’s Rough Riders and starred in Buffalo Bill’s Wild West Show. However, it seems that inklings of the organization existed as early as 1921. 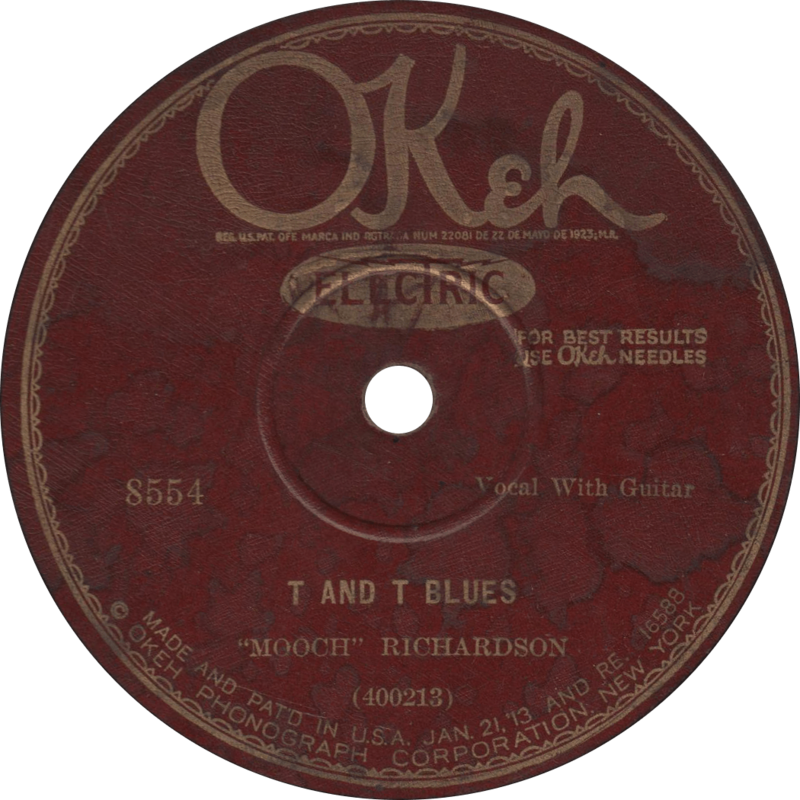 Under McGinty, the band made one record, including the first recording of “Midnight Special”, for Okeh in 1926. Soon after, McGinty retired from music to focus on his ranch and his duties as postmaster of Ripley, Oklahoma, and the band’s manager and announcer Otto Gray assumed leadership. Gray was a Stillwater man, born March 2, 1884. On the side he raised midget cattle on his Oklahoma ranch. 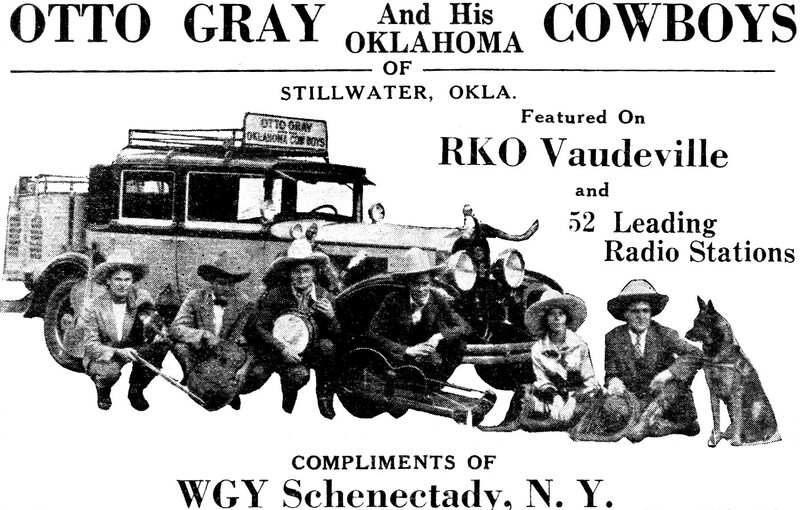 Under Gray’s leadership, the Oklahoma Cowboys toured the vaudeville circuit, and reportedly appeared on over 130 radio station across the States. On the record, they recorded fifteen sides for Gennett in 1928, of which seven were issued, with an additional two in 1930, followed by eighteen sides for Brunswick/Vocalion from 1928 to 1931, all of which were issued. In spite of their relatively prolific recording career, their records are quite scarce today. They shot a one-reeler, titled Otto Gray and his Oklahoma Cowboys, for Veribest Pictures in 1929 or ’30. 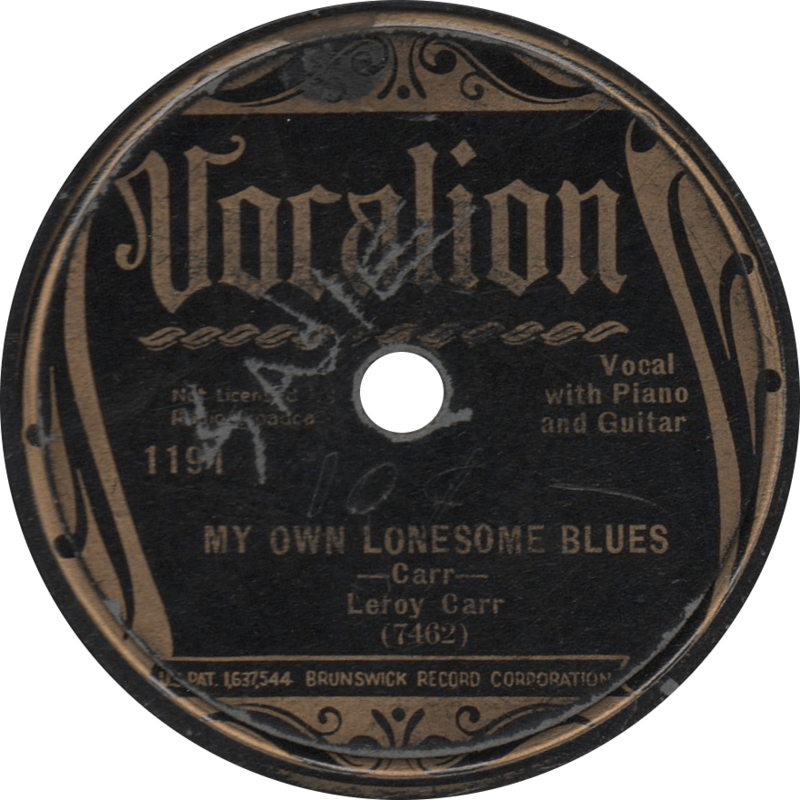 In November, 1930, they published and official songbook, titled Songs: Otto Gray and his Oklahoma Cowboys, which sold for fifty cents a copy and included some hits from their repertoire, such as “Midnight Special” and “Adam and Eve”. On June 6, 1931, they became the first Western band to be featured on the cover of Billboard magazine. The Oklahoma Cowboys continued to perform into the late 1930s; Otto Gray retired from music in 1936. 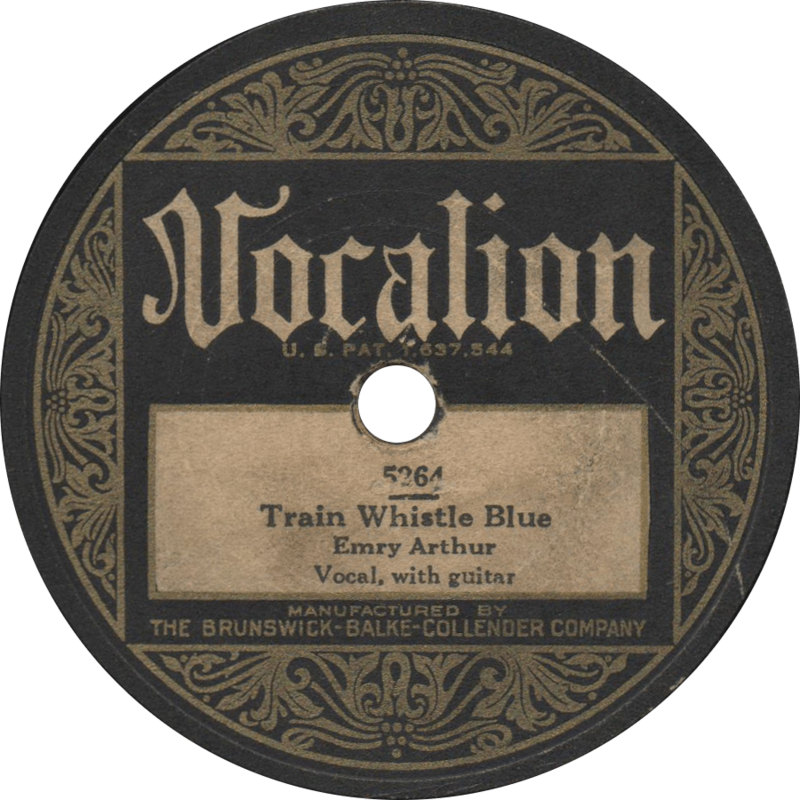 Vocalion 5250 was recorded on September 17, 1928 in Chicago, Illinois. The personnel at this session is unconfirmed, but likely includes “Chief” Sanders on fiddle, Wade “Hy” Allen on left handed tenor banjo, Owen “Zeb” Gray on guitar, and another unknown guitarist—quite possibly Lee “Zeke” Allen, seeing as he’s only official band member not accounted for in that listing aside from “Mommie”, but I’m not sure if she played an instrument, and he did play second guitar in their 1929 short film. Owen Gray performs the vocals on both sides. First, Zeb tells the story of mankind from Adam to Ford on the humorous “Adam and Eve”. Adam and Eve, recorded September 17, 1928 by Otto Gray and his Cowboy Band. Next, on a popular hillbilly song and staple of the Oklahoma Cowboys’ repertoire, Zeb tells us all that we shouldn’t—or couldn’t—be doing: (don’t try it, ’cause) “It Can’t Be Done”. 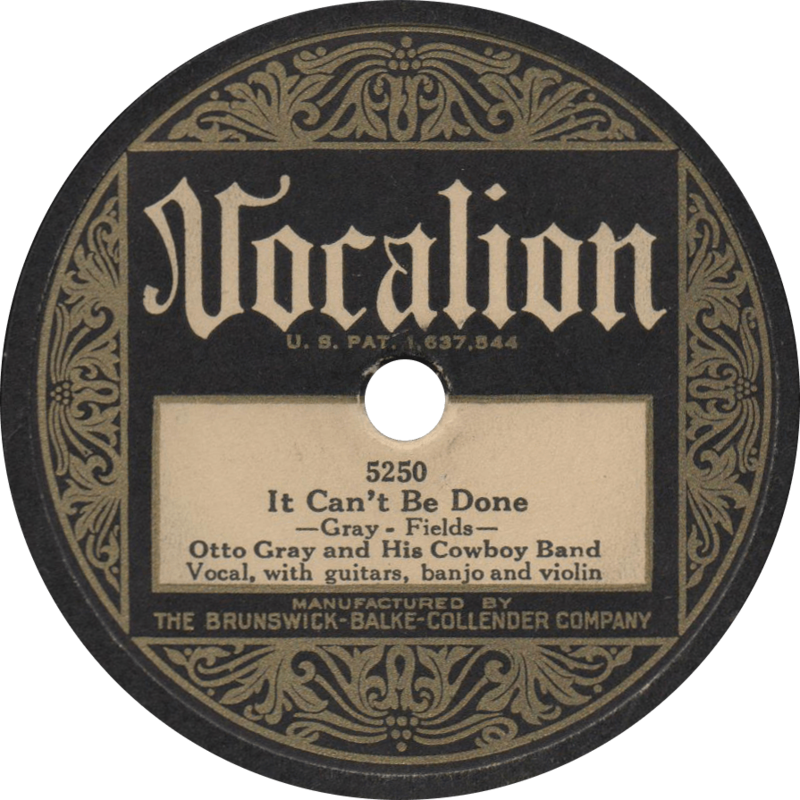 It Can’t Be Done, recorded September 17, 1928 by Otto Gray and his Cowboy Band. 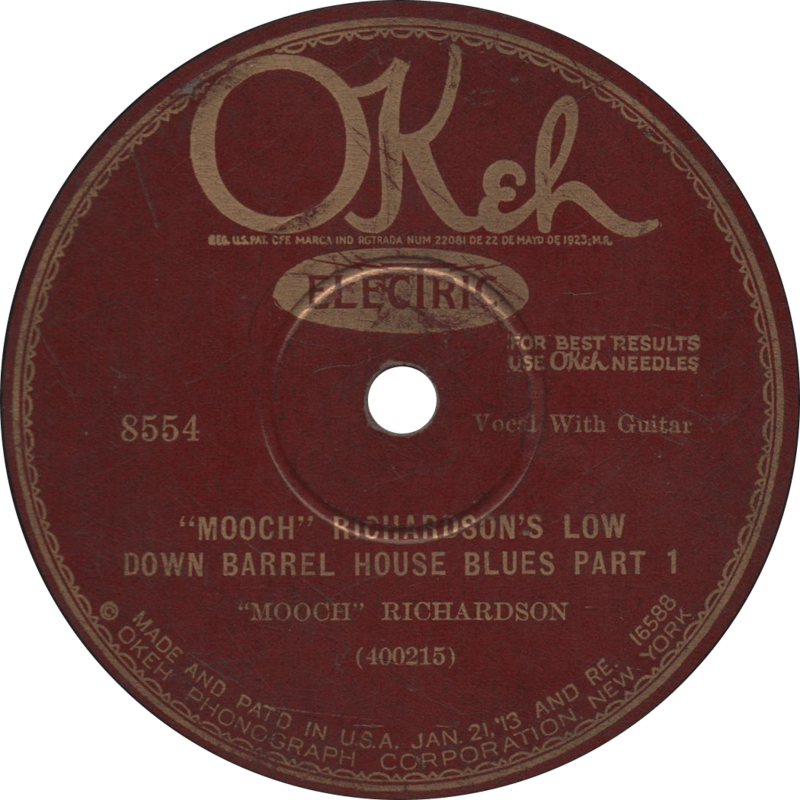 With a repertoire ranging from ragtime to pop songs, the eight songs recorded by the Dallas String Band are incomparable to most anything else on shellac records, and indeed are very difficult to categorize—they’re sometimes characterized as “pre-blues”, but none could technically be classified as blues songs, they bear some resemblance to white Texas string band music, and they’re all listed in Rust’s Jazz Records discography—but they are surely among the most fascinating music ever preserved. It probably wouldn’t be too far fetched to presume that their music bears substantial similarity to rural Afro-American music of the nineteenth century. Though little is known of his life, Coley Jones was a prominent figure in the Afro-American music scene of Dallas, Texas in the 1920s. Born most likely in the 1880s, and may have been in Dallas by the turn of the century. As an itinerant musician, playing in medicine show type venues, his repertoire consisted largely of folk songs and old minstrel tunes like “Drunkard’s Special” and “Traveling Man”. Jones’ most notable contribution to music was as a member of the Dallas String Band, along with Marco Washington—stepfather of Dallas native Aaron Walker, also known as “Oak Cliff T-Bone”, and later as “T-Bone Walker”—and Sam Harris, playing music that could best be described as “pre-blues”. Their repertoire was drawn largely from minstrel, vaudeville, and ragtime traditions, including such songs as “So Tired” and “Chasin’ Rainbows”, as well as popular songs like “Shine” and “Sugar Blues”. In addition to the Dallas String Band, Jones was a member of a jazz band by the name of the Satisfied Five, which also included noted drummer Herbert Cowans, with whom he broadcasted on WFAA and played at the famed Baker Hotel in Mineral Wells. Every December from 1927 until 1929, Jones recorded for Columbia Records when they made field trips to Dallas. 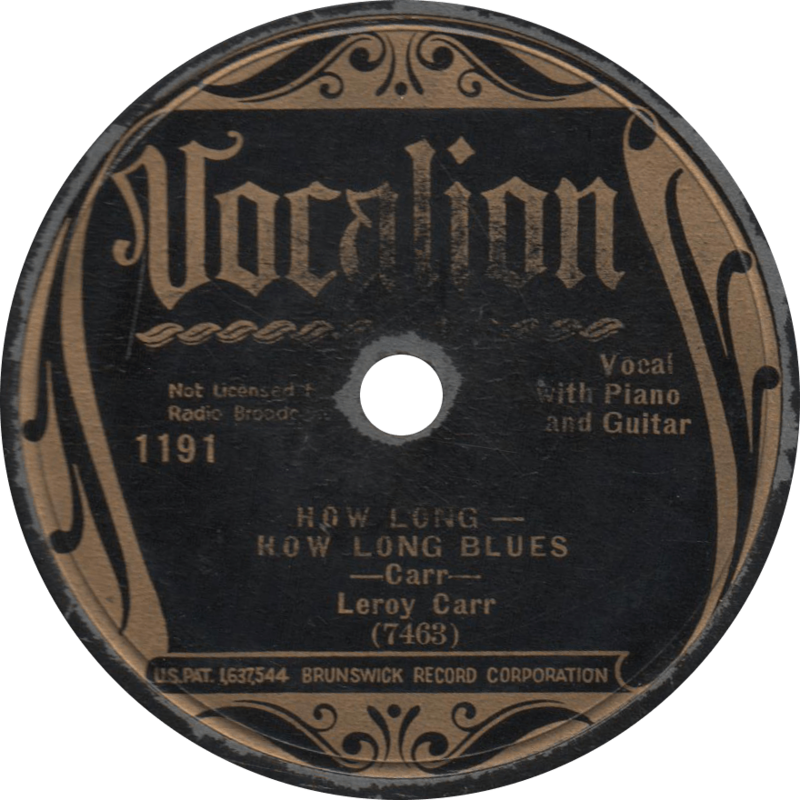 In addition to recording twenty-one sides of his own—solo, in duet with Bobbie Cadillac—and with the Dallas String Band, he accompanied local musicians Texas Bill Day and Billiken Johnson on a further six. 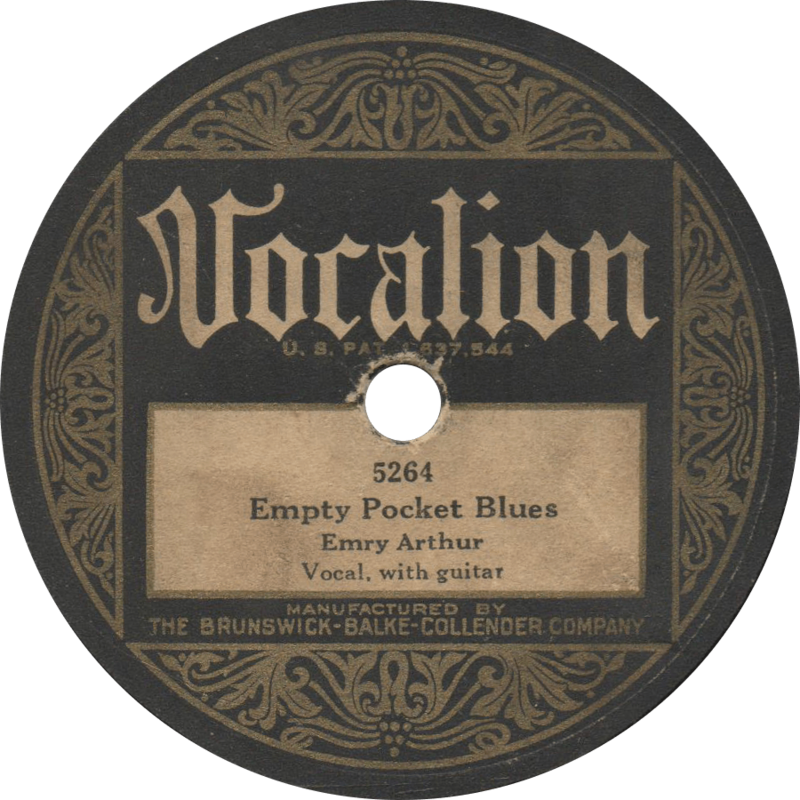 He probably also recorded two unissued sides for Brunswick under the pseudonym “Coley Dotson” in 1929. Following his brief recording career, Jones’ whereabouts are largely unknown, and he is presumed to have died in the 1930s. Posthumously, Jones’ “Drunkard’s Special”, based on an old British folk song, was included on Harry Smith’s legendary Anthology of American Folk Music, and the Dallas String Band’s “So Tired” appeared in Terry Zwigoff’s 2001 motion picture Ghost World. Columbia 14410-D was recorded on December 9, 1928 in Dallas, Texas. The Dallas String Band is made up of Coley Jones on mandolin and lead vocals, probably Sam Harris on guitar, and Marco Washington on string bass. Rust lists an unknown second mandolin, but I’m not so sure. On the first side, they play the sublime “Chasin’ Rainbows”. I wouldn’t be exaggerating one bit to place this song easily in my top ten favorite recordings. The song is perhaps better known by the cover version by R. Crumb’s Cheap Suit Serenaders to audiences outside of, well, R. Crumb (and the few of us out there like him). 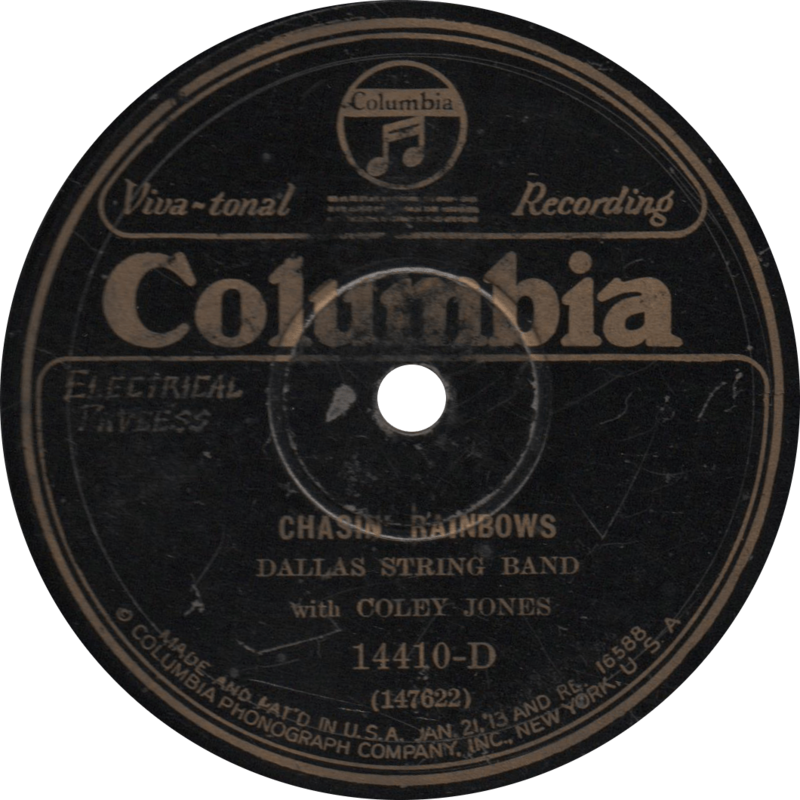 Chasin’ Rainbows, recorded December 9, 1928 by the Dallas String Band with Coley Jones. On the reverse, “I Used to Call Her Baby” is another pleasing raggy number, played this time with a little more pep. 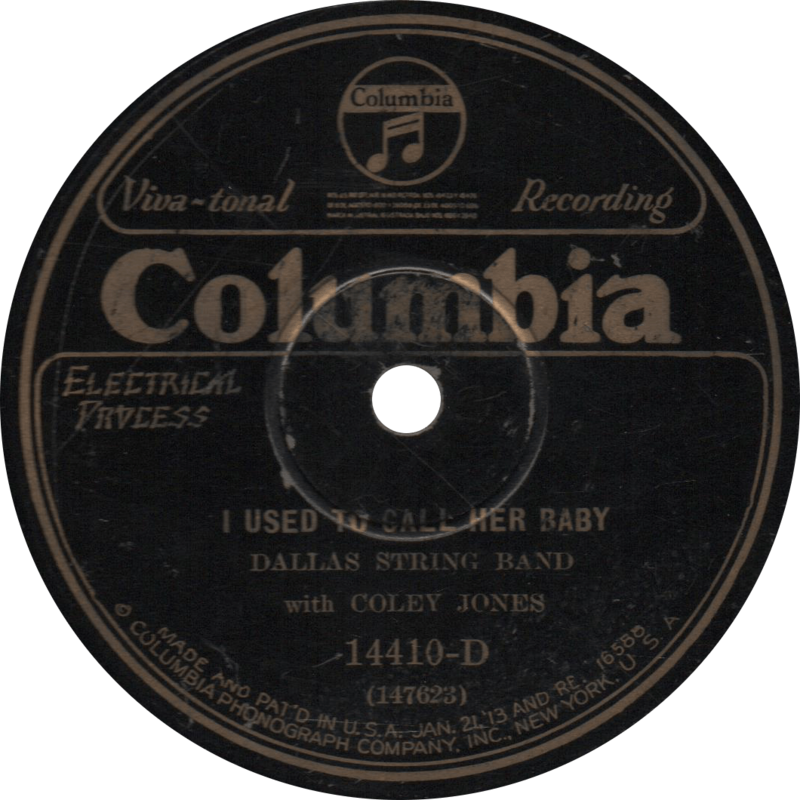 I Used to Call Her Baby, recorded December 9, 1928 by the Dallas String Band with Coley Jones.